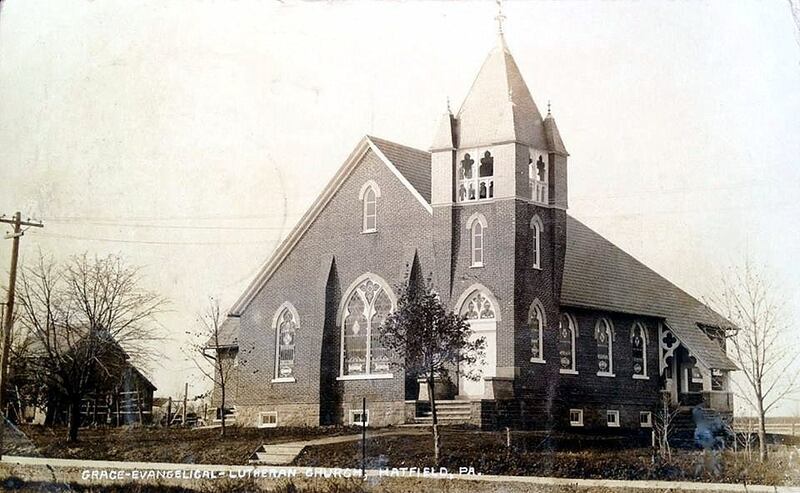 The first Lutheran service in Hatfield was held in Knipe’s Hall on October 8, 1899, with Pastor Kuehner leading worship. Under the leadership of the Rev. Preston A. Behler “Grace Evangelical Lutheran Church of Hatfield, Pa,” was organized on May 12 1904, with 32 charter members. Within three weeks a lot was secured and on October 2nd of the same year the cornerstone was laid for Hatfield’s first Lutheran Church. 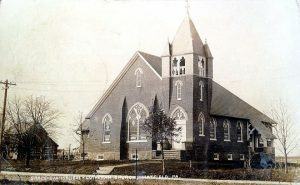 In the summer of 1905 the first services were held in the new building and it was dedicated on August 27th of that year. The total cost of the new church and lot was $6200. On April 27, 1915 a lot on the north side of town was purchased and became the Hatfield Cemetery; it is 5 acres and 75 perches. Multiple shared pastors served the congregation for several years until Grace Church became self-sustaining when Rev. William A. Fluck of Reading, Pa, was called to become their first full time Pastor on July I, 1946. In June of 1954, ground was broken for an addition to the church to provide Sunday Church School rooms with social facilities in the basement. In 1962, Grace Evangelical Lutheran Church became a member of the Lutheran Church of America and also “burned the mortgage” on their new addition. In 1970 Mrs. Rachael Long was hired to organize and direct a Nursery School program for children ages three to five. The program began with a total of eighteen children. In 1980, a daycare program was added to serve school age children before and after school. Shortly thereafter the day care was expanded to year round and to include pre-school children as well. It is still operating today as Stepping Stones Day Care and Nursery School and has provided a warm, caring atmosphere of learning for thousands of children from Hatfield and the surrounding communities. In 1988, the Laymen Playmen staged their first production, Our Town, at Grace church. This was the first of the annual productions by the Laymen Playmen. The Hatfield Pastor’s fund benefits from the February performances provided by community volunteers. In April of 1989 work began on a new Sanctuary which was completed and dedicated on April 22, 1990. The original building underwent extensive renovation and was used as the educational building and was home to various community groups. On New Year’s Eve, 2011, the original building burned to the ground. Following the fire, there was time needed to reflect and plan. A feasibility study was conducted, followed by a capital campaign, “Growing in God’s Grace” with a goal of $250,000. and raised over $300,000. toward a new and renewed church facility. Construction began in the summer of 2015. The congregation moved into the new part of the facility on Reformation Sunday, 2016 and into the renovated Sanctuary at Christmastime. A Dedication Service was held on February 26, 2017. We are blessed to be back in Hatfield with a beautiful new church home to meet ministry needs now and into the future. We would be blessed to have you join us in this Spirit journey.